Are you bored today? Perhaps you’re interested in a little test? Here’s something fun. Images are a great way to test your “out of the box” thinking skills. What’s even better, is when you’ve beaten the test, you can take the results and shove them right in your family and friends’ face! Now, we don’t always suggest that, but perhaps sharing the challenge with your loved ones might be a great way to share the fun. This particular painting was created by Bev Doolittle and it will definitely test your “out of the box” thinking skills. Can you see the horses neatly disguised within the mountains? This beautiful illusion image is “Pintos,” and created using canvas and paintbrush- isn’t art beautiful when it isn’t created just in Photoshop? So, the question is, is it a mountain? Or is it # amount of horses? 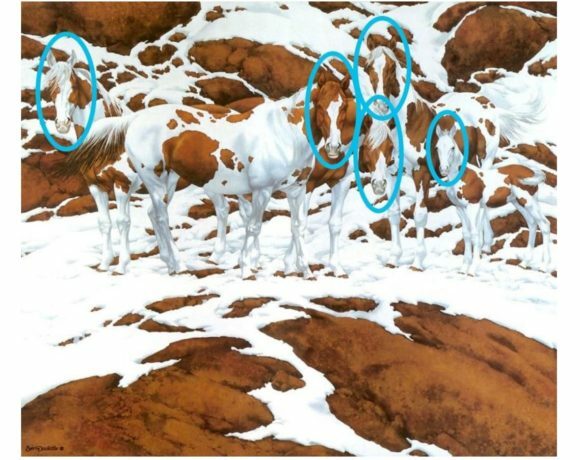 The challenge: try to find out the correct number of horses in the painting. Some say there are 6 or 7. Spot the horses? I mean cows =) Just joking! There are five horses pointed out in the image below. Many posts around the internet claim that there are additional two horses that will drive anyone crazy… but don’t bother searching for another two horses as there are only five in this mesmerizing picture. The horses huddle together in the center of the painting. As you start looking closely, you can notice the outline of the horses’ snouts and the ears. 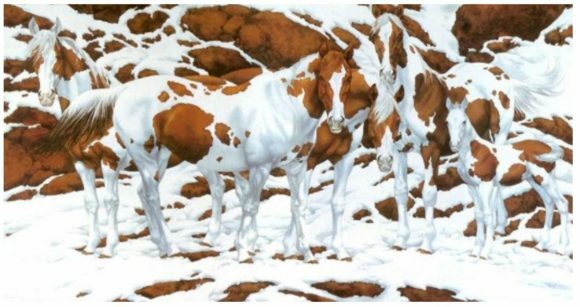 You may think there are additional horses in the background, but that is the beauty of this illusion. Well done Mr. Doolittle.